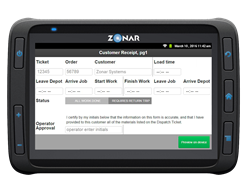 Zonar, the leader in a smart fleet management technology, announced today, ZFormsTM, a forms based messaging application that enables fleets to replace paper forms, share route dispatch assignments, gain efficiency and improve communication between dispatchers and drivers. ZForms helps streamline fleet workflows and is available for Zonar Ground Traffic Control® and 2020® mobile communications tablet users. ZForms comes equipped with access to a library of commonly used message templates and forms designed to meet the needs of customers across a variety of industries including pupil transportation, commercial trucking, transit, retail, municipality and construction. Prepopulated report templates include route assignments, load assignments, delivery receipts, time sheets, trip reports and work orders. If the existing library of messaging templates don’t meet a fleet’s exact needs they can be easily customized.